Now that the decades-long conflict has abated, visitors—and hope—are returning to northern and eastern Sri Lanka. Samanth Subramanian uncovers the little-known treasures, from virgin forests and beaches to remarkable temples and romantic lodges, that are putting the region back in the spotlight. It was a stroke of fine fortune, rather than a feat of careful planning, that took us to the Buddhist temple at Thiriyaya at dawn. On our way there the previous afternoon, turning inland from Sri Lanka’s northeastern coast, we had hit a gargantuan front of rain. The red mud path through the jungle had collapsed into slush as we drove, and tramping up a hill to the temple in the fast- dwindling light held no appeal. So we roused ourselves in the slate-gray hours of the following morning and returned to Thiriyaya just in time to see the sun burst into the sky. To reach the temple, a visitor must ascend 277 broad stone steps, above which meet the limbs of mighty ficus trees. That morning, macaques clambered through branches over our heads, setting off rustles that sounded like rain. At the top, the temple was deserted. In silence, we walked toward the central reliquary, where a ziggurat of brick is thought to contain one of the Buddha’s hairs. Statues of the Buddha in meditation sat at the four cardinal points, the previous day’s flower offerings wilting slowly at their feet. In the predawn gloom, the temple seemed cold and forbidding. But when the sun rose over the ocean, it washed Thiriyaya with orange light, rekindling an ancient heat within its blocks of stone. Legend has it that the temple has stood at Thiriyaya, more or less unchanged, for 2,600 years, which would make it the oldest Buddhist structure in the world. For Sri Lanka’s Buddhists—all of them Sinhala speakers—it is a venerated shrine, but in the 1980s, pilgrims stopped coming here. The temple fell too far inside territory controlled by the Tamil Tigers, the guerrillas who wanted a sovereign nation for Tamil Hindus and Christians hacked out of the island’s northeast. The war between the Tigers and the state ran long: 26 years from the first bullet to the last, beginning with a furtive Tiger ambush in 1983 and ending with the army’s blood-soaked obliteration of the insurgents in 2009. In that toxic, terrifying time, more than 100,000 people died. Relations between the two communities started to fray in the decade following Sri Lankan independence in 1948, when the government passed legislation favoring the Sinhala-speaking majority over the Tamil-speaking minority. Riots punctuated the country’s early decades—macabre affairs in which Sinhalese mobs attacked Tamils, burning their houses and shops. The Tigers, who formed in the 1970s, believed that real freedom for Tamils could be won only through violence. As the conflict escalated, they slid into barbarism, killing not only Sinhalese civilians but also other Tamils who opposed their radical, violent program. The relentless bombardment that finally ended the war focused on a corner of the country—not very far from Thiriyaya, in fact—where both Tigers and Tamil civilians were huddled. The artillery gunners were indifferent to the identities of their targets; the United Nations estimates that as many as 40,000 Tamil noncombatants may have died in those final months alone. Mahinda Rajapaksa, the president who ordered the assault, governed until January of this year. Inevitably, the war—and its denouement, particularly—engendered a culture of pain and fear, of divided loyalties and profound mistrust. The peace, since 2009, has been fraught and complicated. But the election in January of a moderate new president, Maithripala Sirisena, has relaxed Sri Lanka. Slender but genuine possibilities have bloomed: of reconciling ethnic tensions, of bringing war criminals to justice, of exorcising the brutal, corrupt spirit of the previous government, and of moving toward full political and civic freedom for minorities. The island is more open and inviting than it has been in decades, especially in the much-visited south, where tourism is well established. 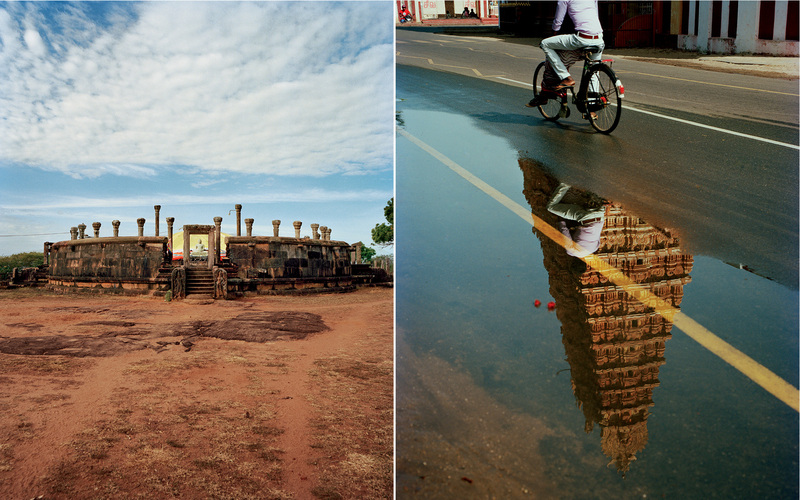 From left: the Buddhist temple at Thiriyaya; the Kandaswamy Hindu temple in Nallur, outside Jaffna. Nowhere is this openness more significant, or more welcome, than in the north and east, former battle zones that yield little-known treasures: monuments and beaches and forests, vibrant food and a beguiling, languorous way of life. The temple at Thiriyaya, as it quietly returns to life, is a fine example. The Sri Lankan navy now maintains the site, but an air of seclusion continues to hang low over its still ponds and shady, wooded grounds. The stillness of the north and east offers a sharp contrast to the mood in the capital, Colombo, which is where I began my journey—as most visitors to the island will. Not surprisingly, that city has seen the most change since the war’s end. The difference is particularly evident in Fort, a 400-year-old hub of government and business that was closed off for decades, for fear of Tiger attacks. The face-lift is the work of the army, which makes for a discomfiting reflection. Gotabhaya Rajapaksa, the previous defense secretary who spearheaded the renovations, is still under a cloud of allegations involving corruption and human-rights abuses, and in parts of the country, soldiers are still regarded with wary mistrust. But the army’s adventures in urban planning have provided the sort of public spaces the city lacked in wartime: Fort, the Racecourse, Arcade Independence Square. It’s hard not to feel enthusiastic about the fact they’re being conserved. An apartment tower designed by the Israeli architect Moshe Safdie will soon join the skyline, as will sheaves of new hotels. The city even has an art biennial and an annual theater festival. As I walked around the city, it felt as if Colombo was learning afresh how to live without worrying, every second of every day, about a war in the north that could split the country asunder. I lived in Sri Lanka for 10 months in 2011 and 2012, researching a book about the war. In that time, no place seeped into my soul in quite the way Jaffna did. Even today, its scorching, white light appears in my dreams; my subconscious, sleeping self feels a phantom heat, and knows it is back there. A peninsula of land bending westward out of the island’s tapered north, Jaffna was the spiritual fount of the Tigers. The movement began here, in the 1970s. The town had seen no real fighting since 1995, but when I first visited in 2011, it still looked freshly wrecked. Roads were shredded, there were bombed-out houses everywhere, and Tamils lived unobtrusively, sotto voce, so as not to attract the attention of the army. Every time I took an overnight bus to Jaffna, I had to dismount at a checkpoint, around 1 a.m., and explain to the officer on duty why I was headed there. For a while, last year, the government renewed a ban on foreigners traveling to Jaffna altogether. 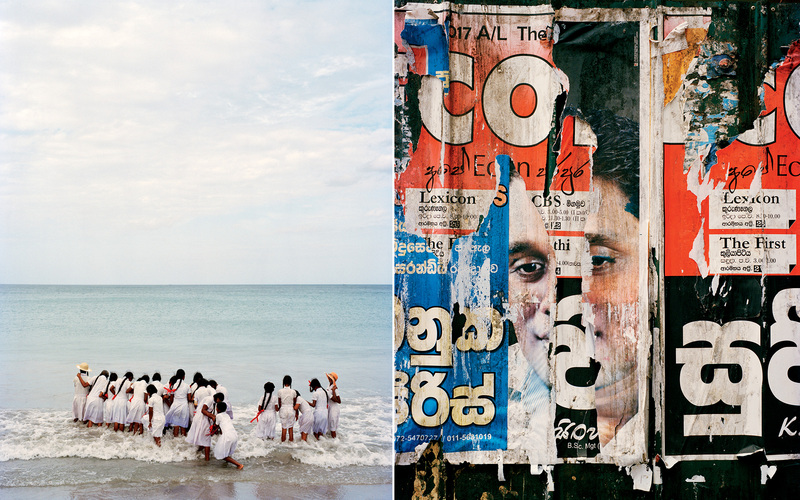 From left: Schoolgirls on Nilaveli Beach, in Trincomalee; Sinhala-language posters on the streets of Jaffna. These curbs have vanished. In addition to an impeccable highway and restored service on a train called Queen of Jaffna, there are now flights out of Colombo three mornings a week. Trundling toward town from the airport, I inspected the passing sights for signs of change, and found them. The streets were better-paved. Houses had been fixed up. The small Hindu shrines that sat on every street corner gleamed with new coats of paint, and the half-dozen streets downtown thrummed with activity. Pathytharan—Pathy, as he insists—has large, doleful eyes and a habitually wry demeanor. For two days, he and I rode around the peninsula together, absorbing its understated pleasures. On the second day, he showed up in an Austin Cambridge, one of the prewar cars that still ply the streets as taxis, driven by a man who appeared just as antique as his conveyance. We stopped by the old Hindu temples of Maviddapuram and Keerimalai, both in need of renovation, but functioning nonetheless. Within their dimly lit chambers, shirtless men prostrated themselves in prayer to Murugan, the god of war. Later, at Casuarina Beach, we drank coconut water and watched bathers in the sea, the bed so sandy that the water appeared nearly beige. Behind us, a snack shop played old Tamil songs about love in the moonlight. The days were bright and intensely hot; the sun throwing the sharp, deep shadows of a de Chirico painting. Jaffna’s food seemed to have absorbed the temper of its climate: fiery curries of fresh crab; an addictive relish of grated coconut, chiles, and cured tuna; vegetables diced and spiced. The heat inflamed our senses, shook us awake. An hour out of Jaffna, a spanking-new road curves east and south, through patches of tidy farmland. In 2009, a pitted, rutted version led straight into the heart of the final battle between the Tigers and the army, and I knew very well the places that now flashed past: Puthukkudiyiruppu, the location of a creepy, triumphalist museum of armaments captured from the Tigers; Mullivaikal, where thousands of Tamils had huddled as shells hailed down from the sky; the Nandikadal lagoon, the site of the army’s victory. Sections of this region are still marked off as high-security zones, and when I saw the fences I flinched, remembering the devastating stories of the people who had died here. In moments like these, it seemed unconscionable to have returned as a tourist to a country that had not yet made amends for its wartime atrocities. Then, a few miles later, I would watch kingfishers and Brahminy kites swooping and rising over shimmering marshes and forget, for a while, about the war. My own moral dilemma, I thought, must be of a piece with Sri Lanka’s: How muc' of the past should we hold on to, and what should we let go? Near Trincomalee on Sri Lanka’s eastern coast, we snorkeled and went scuba diving off Pigeon Island, a nub of sand and rock just off the shore. Whales and dolphins course regularly through these waters, but we glimpsed neither. I had to be content with clown fish and parrot fish hot-stepping through the coral; others in our party waddled back onto the beach reporting sightings of reef sharks and turtles. Sri Lanka’s southwestern coast is renowned, and heavily visited, for its splendid beaches and grand, luxurious hotels; here in the east, the beaches lining the Bay of Bengal felt new and undiscovered. Our hotel, Uga Jungle Beach, was sandwiched between the forest fringe and the aquamarine waters of the ocean, and the wild world intersected regularly with our own. One evening, we followed a monstrous kalaguyo (a variety of large lizard) oozing across our hotel’s path to the beach; at breakfast the next morning, a sambar deer stalked up to a neighboring table, nuzzled a pot of jam, accepted a roll, and swallowed it thoughtfully before heading back into the brush. 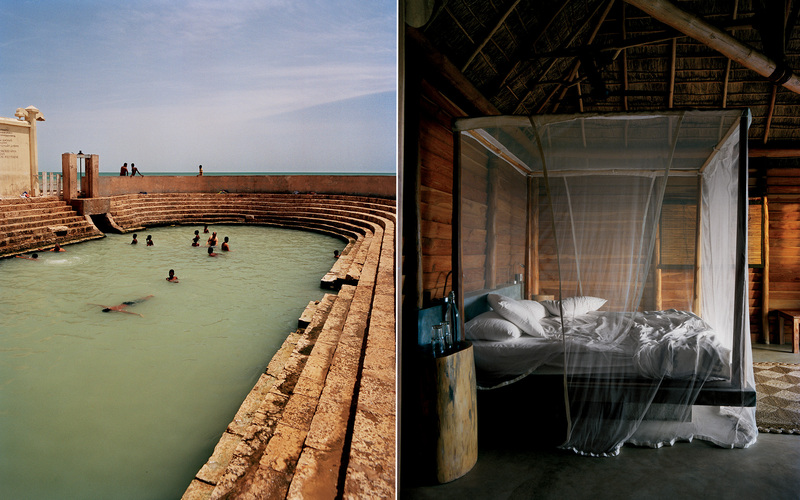 Left: The sacred springs at Keerimalai, near Jaffna, which Hindus believe have healing properties; a guest room at Gal Oya Lodge, in Gal Oya National Park. After visiting Thiriyaya, we drove south, through the great harbor towns of Trincomalee and Batticaloa, where the Tigers and the army had once fought so persistently for control of the ports. As recently as 2008, when the war had weakened the insurgents, their guerrilla aircraft bombed the port at Trincomalee—an act that had so little strategic effect, it must have been born out of sheer frustration. Turning inland, we skirted Sri Lanka’s largest lake before entering Gal Oya National Park. On our cell phones, the signal flickered and expired. A steamy mixture of mountain forest and savanna-like grassland, Gal Oya is home, most excitingly, to elephants and leopards. We were staying at the Gal Oya Lodge, a new eco-resort on the park’s perimeter. On our jeep sorties into the forest, Damien Mario, the lodge’s resident naturalist, raked the brush constantly with his binoculars, trying to spot concealed beasts, but we had no luck. Nevertheless, Mario was chipper. It felt like a blessing even to be here. “This park was closed off for many years during the war, and the Tigers hid out in these forests,” he said. The army reclaimed the area a decade ago, but visitors were reluctant to venture here as long as the war raged. Left to his own devices, Mario would have spent all day in the forest. He was young—in his early 20s—and, intriguingly, half Tamil and half Sinhalese, but talk of the war held his attention only momentarily. His gaze strayed all the time—upward, to identify a smudge in the treetops as a species of parrot, or toward the ground, to pick out elephant tracks. Perhaps he was too young for the past to have deeply affected him, I thought at first; only later did I understand that his present, the here-and-now of Gal Oya and its wildlife, was simply more entrancing and more important. Perhaps it was really a little thing, this ability to be unencumbered by memories of the war, but to me it felt like something momentous and new. At Gal Oya Lodge, we stayed in rustic little cabins embedded in the forest, walking up to the main, splitlevel building for our meals. The lobby had no doors at all, so we could sink into armchairs with cups of tea and watch chains of clouds wrap themselves around the looming mountains. In the courtyard was the most perfect pool I’ve ever seen: subtly curved and limpid blue, positioned so that the land seemed to rise up and away just where the water ended, as if the earth cupped you in its palm as you swam. On our final evening, Mario organized a forest expedition led by Danigala Maha Bandaralage Thutha. Thutha is one of the senior leaders of the local Vedda tribe, a group of aborigines that populated Sri Lanka long before Sinhala or Tamil were spoken here. The Veddas have shrunk in number now, but they are a reminder of an older island life, one that predates sharp ethnic or religious divisions. 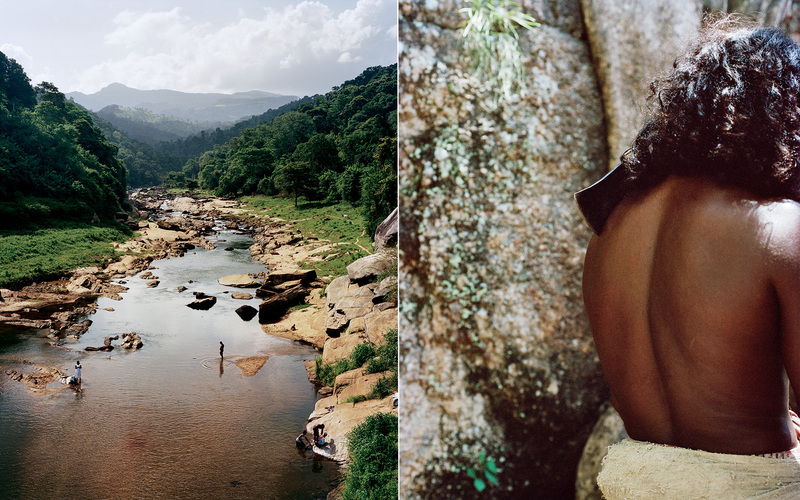 From left: Villagers wash in the Mahaweli River near Gal Oya National Park; One of the Vedda tribesmen who give tours of the forest at Gal Oya Lodge. Thutha had a wiry white beard, and he wore nothing but a sarong. An ax swung freely on his back, its blade resting just inches from his spine; his feet, I noticed as we tramped through the forest behind him, were bare. Thutha wanted to show us how the Veddas had once inhabited the forest. Moving swiftly through the undergrowth, he halted to give us lessons: three types of leaves that can treat snakebite; pangolin burrows in the earth; herbs to cure a stomachache; a plant that, if burned, can drive bees out of their hives. Following a stream up its rocky course, we arrived at a square hole carved out of a large rock, with a lid to match. An old, unused Vedda refrigerator, Thutha said. Put dried meat at the bottom, cover it with honey, and it will keep for years. An hour or so into our walk, it began to rain: big, fat, tropical drops, crashing through the canopy. My glasses fogged up and our umbrellas snagged on tree branches. We struggled to see where we were going, so we kept our eyes fixed on Thutha up ahead. One minute he was invisible, absorbed by the foliage. The next minute he was back, this most original of Sri Lankans, leaping over fallen trees, wading through a stream, peering at the sodden sky, plainly reveling in the vehement beauty of his land. A number of international carriers offer one-stop service to Colombo from the U.S. Helitours flies domestic routes to Jaffna three times a week; rail service to the city was also recently restored, with daily departures from Colombo. The Sri Lanka–based experts of Experience Travel Group can arrange your trip to the country’s north and east with a range of custom-designed itineraries. experiencetravelgroup.com; Two-week trips from $3,100 per person. Colombo Courtyard: A boutique hotel in downtown Colombo that prides itself on being carbon-neutral. colombocourtyard.com; Doubles from $113. Gal Oya Lodge: A safari-lodge-style property near the national park, with rustic cottages and in-house naturalists. galoyalodge.com; Doubles from $155. Uga Jungle Beach: An extensive resort with 48 cabins fronting a secluded beach, a half-hour outside Trincomalee. ugaescapes.com; Doubles from $250. Fernando’s Bar: A beachfront seafood eatery at the Aqua Inns Hotel in Trincomalee. 12 Alles Garden; 94-77-854-6139; Entrées $6–$36. Green Grass Hotel & Restaurant: Ideal for local specialties like crab curry. Jaffna; jaffnagreengrass.com; Curries $3–$5. Rare: Combines traditional Sri Lankan ingredients and Western techniques; try the T-bone steak with tempered yams. Colombo; ugaescapes.com; Entrées $8–$33. Colombo City Walks: Native Sri Lankan Mark Forbes hosts history-filled tours through old Colombo. colombocitywalks.blogspot.com; Tours from $40 per person. Poseidon Diving Station: A snorkeling and scuba-diving outfitter a short drive from Trincomalee. divingsrilanka.com; Dives from $80 per person.